The mountains of Western Montana called out to Steve’s soul. Consequently, he moved to the Bitterroot Valley of Montana in 2006 to begin a new personal and professional life. The spirit of freedom that Montanans live their lives resonated with Steve’s own attitude of independence and personal responsibility. He takes inspiration from the homesteaders who settled the Montana Territory starting about 140 years ago. Create a better life for yourself. Like them, Steve came to plow his own fields of freedom and plant his own seeds of personal growth in Montana. This website was created because it’s what Steve does – he organizes people and events. After moving to Montana a decade ago, he realized there wasn’t a single place that a business wanting to organize a meeting, convention, or conference could search. As a result of this need, Montana-Speaker.com was born. Here you’ll find speaking professionals who can train, educate, and/or entertain your organization. You’ll also be able to select the perfect venue to host your special event. Over the years Steve has re-invented himself no less than sixteen major times in his life. This penchant for change in his own life has given him the perspective and knowledge to help others initiate change. Organizations and people all understand the need for change on an intellectual level – Steve helps bridge the gap to emotional acceptance of change. Steve helps individuals understand the need for and overcome their fears/resistance to change. 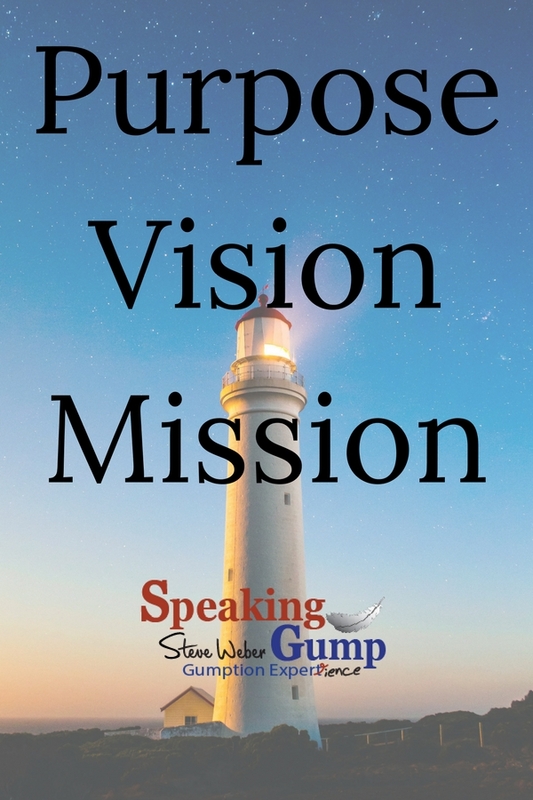 Steve’s purpose is to combine the Gump character with his authentic self to make the world a better place. He does this by being positive, visionary, and loving. Steve promotes individual freedom, common sense solutions, and 100% personal responsibility. Steve’s mission is to create experiences that inspire groups and individuals to think big, embrace change, and take 100% personal responsibility for their part in making the world a better place. Today, Steve works with organizations that need change initiated quickly. He works to minimize disruption and loss of productivity that results when people feel confused or left in the dark. He strives for complete employee buy-in that will last for the long-run. Steve accomplishes this through direct communication with the entire organization as CEO liaison, change ambassador, host, speaker, and communication expert. When Steve moved to Montana, he committed to become part of the community. They say that Montana is simply a big town with many neighborhoods separated by hundreds of miles. Steve is committed to being part of that big town and working within all the neighborhoods. Regionally, he is an active member of the NSA-Mountain West speakers chapter that includes Idaho, Montana, Utah, & Wyoming. Locally Steve has been involved with the Bitterroot Chamber and helps organize and lead the annual Bitterroot BrewFest. This website was designed to help organizations find professional speakers to participate in their meetings, conferences, or events. The speakers listed are a combination of members and non-members of NSA. They are both friends and professional colleagues of Steve. Every speaker listed shares an important message that Steve endorses. Speakers include trainers, experts, guides, and keynoters. They are coaches, authors, artists, consultants and more. Officially, organizing the speakers on this website is an independent project from both Steve’s Speaking/Consulting business and from the official NSA-Mountain West chapter. But the reality is they are closely related and are connected in spirit. Montana Venues is where Montanans get together for their meetings, conferences, and events. The venues are listed in four categories: Convention centers, Conference centers, Hotels with meeting rooms, and Business Retreats. They are also listed by region/location. Steve felt it important to include a person and face with each venue. He has personally reached out to every contact listed. While Steve hasn’t necessarily worked with each venue, he feels confident to include them based on reputation, website, and the direct communication had with each venue’s contact person. Steve joined the National Speakers Association (NSA) in 2010. After initially declining to join NSA-Mountain West chapter because it was based in Salt Lake City, Steve reconsidered and became an active member. Over the next 3-1/2 years, he attended 25 monthly chapter meetings learning both the speaking business and the Spirit of NSA. He was elected to the Board for two 2-year terms and served as Chapter Secretary for three years. After being termed off the Board, he’s continued to serve as a special Presidential appointee (non-voting Board member). He serves as the Montana liaison for the chapter, assistant to the chapter Secretary, chapter Bylaws/Policy & Procedures expert, and part-time website administrator. In 2009 after attending the Bitterroot BrewFest three times as an attendee, Steve was invited to join the BrewFest Committee. His first project was to increase the number of food vendors as each previous year he waited too long to buy food – it was all gone. During the first year as an active helper, he realized no master plan existed. Over the next few years, Steve took responsibility for all logistics including tents, food vendors, stage, porta-potties, trash cans, electrical, and cleanup. Today – with the help of 8-10 other dedicated committee members – it’s a well-oiled machine. Steve served as co-chair for four years before stepping down. He continues to serve as logistics/setup person and as secretary for the BrewFest committee. The BrewFest is a fundraiser for the Bitterroot Chamber and has raised over $150,000 for the Chamber in the years since he started to actively participate. It’s also the best outdoor party of the year in the Bitterroot. From 1996 to 2011, Steve was Forrest Gump for Bubba Gump Shrimp Company. As the Forrest Gump lookalike/impersonator, Steve acted as greeter, spokesman, entertainer, and mascot. He was the face of Bubba Gump for twenty-two USA restaurant location openings and eight international locations. Life was better than a box of chocolates for the fifteen years he represented the legendary shrimp restaurant. Learn more About Steve on the SpeakingGump website. Learn more About Steve as the Conference Host and Change Ambassador. See Steve’s Purpose, Vision, and Mission statements. This is the story of how Steve became Forrest Gump for Bubba Gump Shrimp and his 15 year journey of Gumption. Take me to the Gump Years! A short history of Steve’s early influencers and the first two decades of his professional career. Take me to the Pre-Gump story!